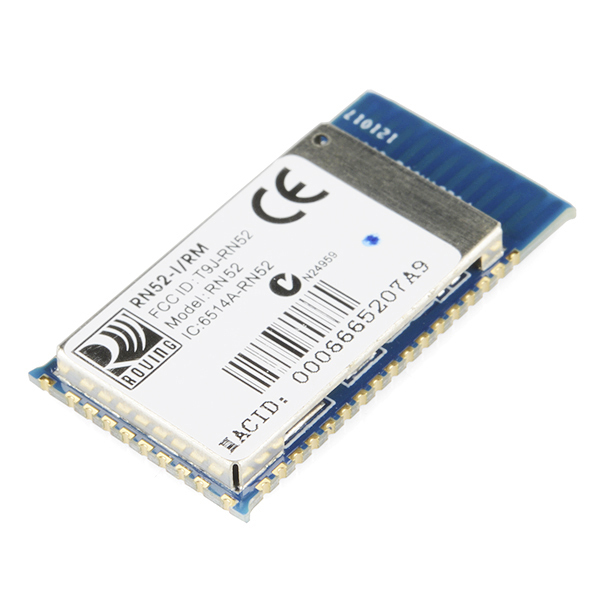 This RN-52 Bluetooth from Roving Network is an audio module that provides a highly integrated solution for delivering high quality stereo audio in a small form factor with little difficulty. This module is perfect for a project involving hands free audio for your car, remote controlling your media center, or streaming 2-channel audio. Does any one know if Sparkfun or someone else sells a board with just Power in, ground, speaker positive, and speaker negative? If not, please look into it Sparkfun. Edit: If Sparkfun develops it, can it be smaller than this board? Hi, I have a "simple" question: How can I program GPIO3 like input and when I push it runs the command C(accept incoming voice call)? I have the same question. It would be great if there were inputs for both accepting and ending calls. Is it possible to issue additional AVRCP commands (such as seek) with this module? I don't see this in the command reference guide but does anybody know if there is a way to activate voice recognition on a phone from this, and tell a phone to redial? Just sending the commands AT+BVRA (voice recognition) and AT+BLDN (redial) wont work as the unit matches the first part of the command AT+(next track), and then ignores the rest. Does anyone know if they command mode may be controlled from the SPI or is it only possible with the UART? Any recommendations on a microphone to use with this unit ? Does anyone know if a breakout board exists for this? Sadly, not yet, but we are working on one! Keep your eyes on the new product page for it. Can you share any news on when a breakout board will be available? As I said, we are working on it, but I can't really give a time frame. Not trying to be annoying... are you guys still working on this breakout board? Yup. Waiting on PCBs and such for prototypes and hopefully will be getting it out soon after that. One more for the 'waiting list' for a .100/breadboard breakout version. Such as shame they couldn't keep the same footprint/package as the 41. Well of course it cant though because it has additional audio pins which the 41 and 42 dont. How many meters can this device transmit data? Please help, I am new. Is it possible to connect one phone to several RN52 ? I want to play the same music on several rn52 from my phone simultaneously. Hi, What about the source mode version when using A2DP profil, did Microchip launched one already ? Or have we to wait for more time ? Thanks ! Any way we could have a Fritzing part for this? Try a different power source. I've seen this with inadequate power supplies. new board shared as: "Sparkfun RN052 Breakout board modified 0.2"
Is it possible to connect two of the RN-52 modules together and allow both modules to receive and send audio simultaneously? Im kind of looking for determining the signal strength of, say my phone. Is the signal strength can be determined using a uC with which it's communicating with? Has anyone had issues with excessive RF noise on the analog output from this? It's fine until I pair with it, then gets even worse when there's audio streaming. Has anyone had any luck connecting a microphone to the RN-52? If so, how'd you do it? I'd love to use it in HFP/HSP mode. Is there any way to capture the audio data from the chip? Either through SPI or UART? So this could be used with the 3.3V version of the Arduino Pro Micro and receive serial commands from the Arduino, right? I plan on making that setup so that the Arduino controls the RN-52 via serial commands, mostly so that I can send the RN-52 commands to re-connect but also to control playback based on analog input into the Arduino. Pretty doable, no? Can this use A2DP when the RN52 is the audio source rather than the sink? "The RN52 is presently limited an A2DP audio sink and SPP slave mode. There is an RN52 firmware update to address known bugs and add an additional CODEC algorithm, but no plans to offer master and slave mode with SPP or sink and source to A2DP in the near future." Can 2 of these chips be connected in parallel to allow for 2 or more bluetooth headsets to receive the audio from the same source? Microchip are launching a source mode version shortly, you will be able to do this with that. Can it pair with a Bluetooth headphone or speaker? 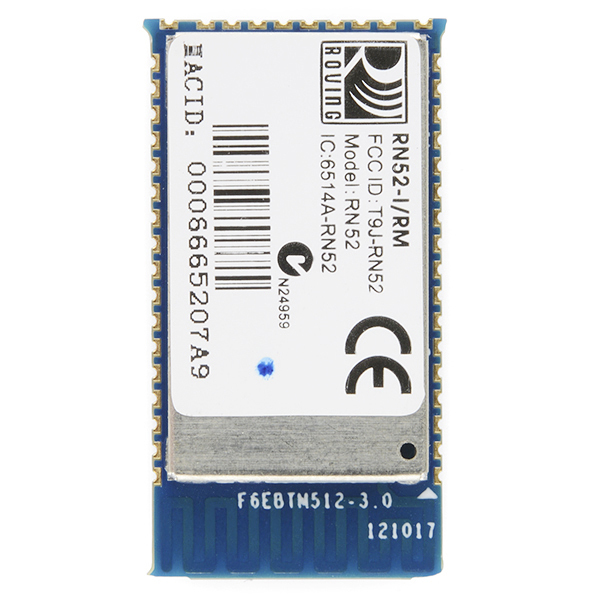 The RN52 is an audio module. BLE isnt audio. BT4.0 is not required for audio. What are you trying to do? For audio it should connect to any phone that supports audio (most headsets are BT2.0 or BT2.1). If you are trying to do data, then you should look at the RN42 or RN41. Your mixing terms. BT4.0 has nothing to do with this. That's a stack version and your phone does support the earlier versions. What you are trying to do is send data and this can be done with both BTC and BTLE. The issue is that Apple doesn't support SPP (serial port profile), they instead made a proprietary one and to be able to use that you need to be a member of Apple's MFi program (mfi.apple.com). If you are using BTLE you dont need to be a member of the program, but BTLE itself doesnt have an SPP, you will need to make your own proprietary profile. why not? - works fine with mine. Well if you are talking data then then there are restrictions. For audio, this audio module will connect to any platform including iOS. For proprietary data you would typically choose to use SPP. Apple doesnt support SPP, instead they have iAP. That requires the auth chip. This module, while designed for audio, will do data. For iAP it therefore still needs the auth chip when doing iAP. That probably sounds like a perfectly good explanation... I just am not too knowledgeable in communications.. thanks! 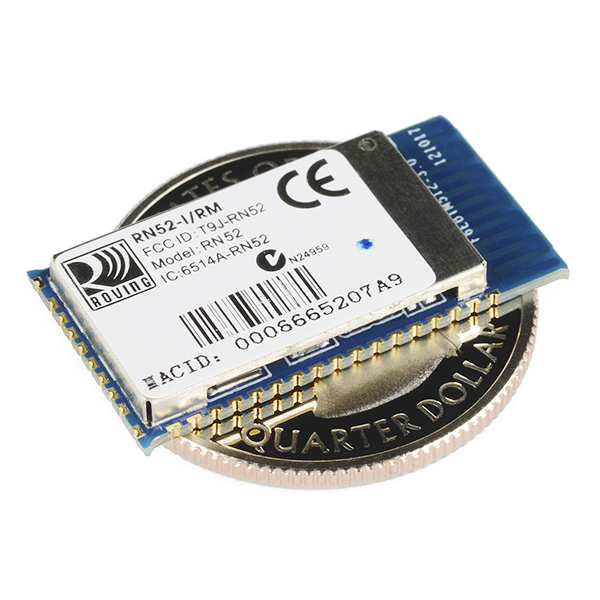 We are working on trying to get a BLE module into the catalog, but have been running into supplier issues. Hopefully soon though! We actually were looking into the BlueGiga, but ran into many of the same prototyping issues as you did. I don't believe that's the current module we are looking at, so hopefully the new one will be a little easier to work with! Also, I'd love to hear what type of application you are working on-I'm studying Biomedical Engineering currently myself! OK I can see that bringing PWREN Hi will wake the module up, but how do I turn it of without removing the power? when this is embedded into a project, do I then have to have two âpower onâ switches ie one to apply power then the second to pull PWREN Hi? or can I leave power applied, and either take PWREN Lo or âsomething elseâ to turn it off / put to sleep? Has anyone created an ExpressPCB/ExpressSCH custom component for this yet? If so, could you post it somewhere and share a link? Thanks in advance! Still no breakout board? I finally broke down and bought one of the chips from Digikey, but it's amazingly tiny... I'm almost afraid to try soldering leads to it. Do we even have an ETA for the breakout board? I think it's only a few weeks out at most. We have them in the building and I believe they are assembled. Senior project begins in a week! Break out board will be most helpful. Please! Possibly the Bluegiga WT32 Bluetooth Audio Module. Been a while since I looked at the data sheet, but it is a pretty versatile chip. Does this module support sending / receiving the ID3 tag information like song & Artist name or does anybody know of a module that does? Well, actually, track information is part of AVRCP profile, just not specifically "ID3". The BlueGiga WT32 (with the latest firmware, probably earlier ones too) does this if the A2DP source (actually, the AVRCP controller) provides the data. It's part of AVRCP profile. For instance, the WT32 will rx the track data from my Galaxy S3 when acting as a A2DP sink and AVRCP target. Not sure about the RN-52 capabilities. In my car I'd like to listen to music from my phone w/o taking it out of the pocket. However, a really cool feature would be displaying the current the song title and artist on my dashboard. The WT32 seems to be the only available module having a full AVRCP1.3 implementation. Do you some documents (pics, schematics, and/or code) that you can share with me? What BT chip is used on this module? I contacted microchip today to see if they intend a firmware update to assist with battery charging via USB. If the device itself cannot request high power operation (and indicate that it is available via an I/O pin) using a USB based charging circuit is going to be problematic. Trying to get away with a design around this that doesn't need a microcontroller, can charge via USB, and keeps the USB available for flashing updates as well. Right now I'm fairly settled on just using an external USB port for charging, and hiding another one inside, under the battery, for flashing. That way the charging circuit can be a MAX8895 or similar, that can handle negotiating high power (or detecting a standalone charger), without the RN52 being involved in charging at all. Does anyone know if this is automatically able to be paired with an iphone to stream music with its default settings? Yep, I plugged it in and immediately connected - no trouble at all. Later on I went in to adjust some settings through the UART - but that isn't necessary for OTB functionality. Does anyone else see Star Trek TNG Communicator Badge? Is there a projected date for the break out board? I've have a project that I was going to use the WT-32 in until I found out about this little guy. I've been waiting months now to get it built. BTW - You guys are awesome! Keep up the great work. I also ordered the development kit from Microchip. 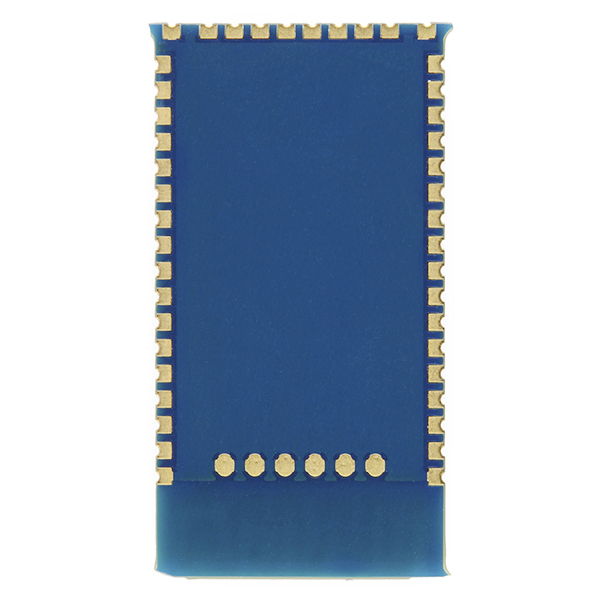 I would like to use third-party (PTT) push to talk applications on my phone via this bluetooth module. I'm also trying to assign a GPIO and I can't seem to find a way to send the correct commands to enable the phone app. Does anyone know maybe how? it uses the HFP and HSP profiles. These are for use with cell phones. PPT is therefore not part of this profile. Iâve been playing with the development kit. I specifically looking to use it as bluetooth PTT (push to talk). I can't seem to find the right command to enable with a third party app running on android. App requires Bluetooth (serial). I would like to assign a GPIO. Anyway in doing so? Also interested in the breakout board (future) and whether any GPIO pins will be included. Where would someone get infomration on creating "modified" firmware? For instance: GPIO5 goes HI with speaker audio out on either speaker (as in PTT) or are one of the LEDs used for such a function? Anyone know? I have an application where I'm just trying to convey audio between the output of a standard DJ type mixer, wirelessly to the input of a powered amp.. so, basically RCA out to RCA in... Will this work for me? Seems simple that it would, but I'm a little concerned because it says it has internal amps to be connected directly to speakers, and it has MIC inputs, rather than "line in" for what that's worth.. Sorry - analog is definitely not my thing..
Also, has anyone got any REAL WORLD experience regarding range? I only need to go about 50', but it will be in a karate studio full of proud parents watching their kids compete, so there will be a lot of Bluetooth devices potentially interfering nearby.. I'm not sure how resilient Bluetooth is in that regard?? the Bluetooth definition of a class 2 device is 20-30m line-of-site. This is a class 2 device. It therefore easily does 50' line-of-site. This device operates the other way around. It is a SINK not a SOURCE. it goes in the speaker end. So if I wanted to pair this with my phone and make a wireless headphone jack (for plugging into a home stereo), would I need to use a pre-amp between the module and the 3.5mm headphone jack? If not, would hooking a set of headphones directly to this module damage it? I finally noticed the datasheet lists "Integrated amplifier for driving 16 Î© speakers" in the features section at the very top. I've been playing with the development kit from Microchip and this module looks really great for audio streaming. You mention programmable I/O pins, but going through the documentation, I haven't found a way to update their functions (while in command mode at least), such as moving the pin locations of the AVRCP commands. Are these only accessible by a firmware update? So happy to see this listed! I was just looking at this on the manufacturer's site last week. For those who can't click on the datasheet link and read the first page, or google "diameter of US quarter", the datasheet says 13.5x26.0x 2.7 mm. But point taken; I don't know why the in/cm rulers were left out of this product's photos but I'll check on that. Suffice it to say that this board is very small. Having now seen the same "quarter comparison" photo on an Australian website, I felt it pertinent to balance my previous whinge with a compliment at the otherwise brilliant website you have created here. Kudos, and please, keep up the good work. The in/cm rulers are very helpful. Does this module bear any relationship to the Bluegiga WT-32 module that used to be available? Similar idea. This would be the module we would recommend as a replacement for the WT-32 if you needed to use bluetooth for an audio application. Otherwise, these are from different companies, and different pieces of hardware. Will this connect to iOS devices? is this direct plug and play with arduino??? If it's a 3.3v Arduino, then yes, you could plug it in directly. Otherwise, you will need to include voltage regulation and logic level shifting. Also keep in mind you will have to solder connectors to this board. Very powerful Bluetooth. Thank you a lot. Versatile, robust and easy to control. The only thing missing for getting 5/5 star review is the PDL (Paired Devices List) management.